Even as marketing shifts further into the digital arena, business cards are an important part of making a first impression. Having a unique or interesting card is a great way to make your company stand out from competitors. However, this doesn’t mean you have to spend a lot of money to have cards printed on fancy paper or designed by a professional. Just make sure that your business cards are appealing, convenient and reflective of your company. Entrepreneur magazine suggested that an unorganized business card may deter potential customers, so it’s better to keep the design simple. Choose only the most important information to include: The company name, logo, phone number and email address are generally essential. If you run a retail store, you’ll also want to include the address. If you’re pressed for space, leave out extraneous information like your cell phone number, fax number, Twitter handle or company motto. Don’t try to cram all your information into the small area. Any graphic designer will tell you that white space isn’t a bad thing! If want to hand out your contact information in a unique medium and make a lasting impression, here are some creative ideas for different industries. What better way to distribute information about your sporting goods store than on a Titleist Business Card Box? This great product contains two custom golf balls that sports fans will surely appreciate. Your contact information is printed on the lid, so customers will think of your company the next time they’re heading out to the green. Doctors and dentists usually hand out appointment reminders in lieu of business cards, but there’s no reason you can’t combine both into one. It’s easy to include your contact information and the office details on one side of the card and have space for appointment details on the other. You can save a little money by having one side printed in color and the other just black and white. To really mix up your cards, Thumbs Up Appointment Magnets are a fun choice. Patients will be able to keep the information about their next visit right on the fridge, where they’ll look at it daily. Instead of handing out mints as patrons leave, restaurants can give out Peppermint Business Cards. The cute containers have plenty of room for the company name and logo and are filled with refreshing candy. This fun twist on business cards will remind patrons of their visit every time they pop a peppermint. 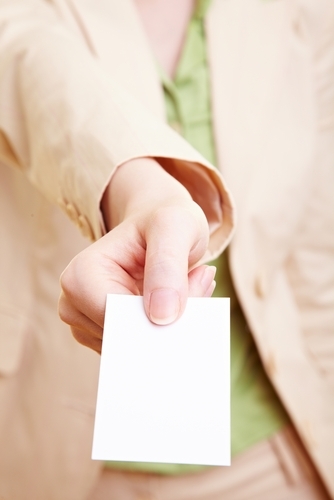 A savvy salesperson makes sure to leave behind a business card or two after each meeting. For important clients, you can make an awesome impression by handing out Gold Chocolate Business Card Gift Boxes. This product helps you deliver your information in a unique and memorable way. The box has a spot under the lid for you to insert your card, and the chocolate bar inside reads, “Thank You.” It’s a great way to ensure clients are reminded of your pitch next time they have a sugar craving. Real estate agents can also make use of business card magnets. Give potential clients a “Sold” Real Estate Promotional Magnet when you show them a new property. They can use it to hang housing brochures from their fridge, and your contact information will be easily accessible if they decide to close the deal.